A car is auctioned at Manheim's Chicago site. Auctions are scrambling to meet clients' demands for more data and analysis. NIAGARA FALLS, ONT. — Rapid change isn’t constrained to new-vehicle sales and technology. It also affects used vehicles and auctions. That’s according to four remarketing executives who spoke on a panel here in April at the Trillium Auto Dealers Association’s Automotive Conference and Expo. Trillium represents more than 1,000 new-vehicle dealers in Ontario. From the rapid growth of online auctions to growing customer demand for quick, online vehicle appraisals, the remarketing space is sure to look different in the near future, said Martin Douglas, director of sales operations at TradeRev. As technology facilitates rapid change, it will be imperative for automakers, dealers and auctions to keep up to ensure the used-vehicle business remains a major source of dealer profitability. Like the rest of the shopping process, consumers are beginning to demand online appraisals, said Jason McClenahan, CEO of EBlock. 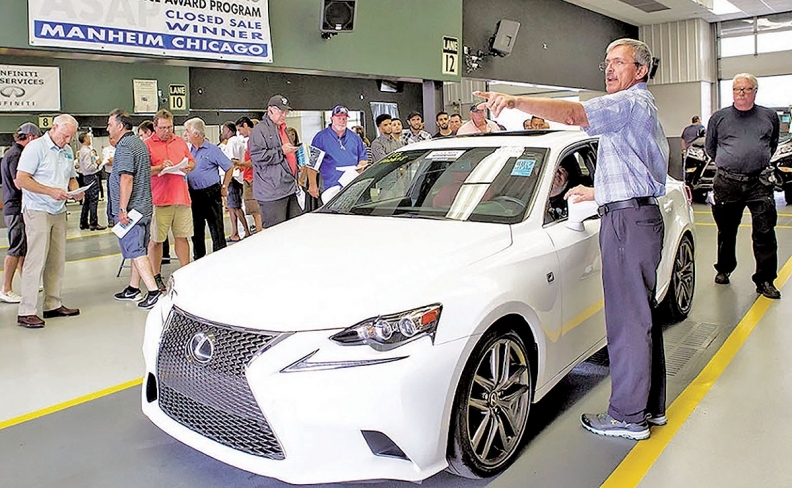 “A lot more dealer groups are going to add a consistent appraisal process that begins on your website and continues into your showroom and continues to the disposal of that trade or unwanted inventory,” he said. Douglas said consumers can be trusted to deliver accurate information on their vehicle trade-in thanks in large part to advancements in technology. Because of VIN scans, clearer photos taken from smartphones and more, dealers can learn much about a car without ever having to see it in person. Customers looking for a new vehicle already know what that vehicle will cost if they build and price a model online. But, because online appraisals are still somewhat rare, they will not know how much money they will receive for their old vehicle. Automakers and dealerships that can get ahead of the curve on online appraisals will reap the benefits, Douglas said. Likewise, online vehicle auctions are growing at a rapid rate. Through vehicle inspection reports, VIN scans and other technologies, more dealerships are skipping physical auctions and instead bid for used vehicles online. “I see the short-term physical auctions stagnating their growth while online options will rapidly grow,” McClenahan said. Two of Canada’s largest auction groups, ADESA and Manheim, have expanded their online auction offerings in recent years as dealer demand for such offerings has increased. “I truly believe vehicles will be sold 100 per cent online in the near future,” McClenahan said. At the same time, automakers in Canada are spending more on certified pre-owned (CPO) programs as a way to sell growing used-vehicle inventory. According to Joel Gregory, remarketing and CPO manager at Hyundai Canada, CPO sales experienced 13 per cent year-over-year growth in 2017, though levels still lag those in the United States. “That speaks to the importance that [automakers] are putting on this particular genre of selling vehicles,” he said. As automakers put more importance on CPO programs, Gregory said, it will be imperative for them to explain to customers the difference between a CPO vehicle, which has been inspected and repaired before the sale, and a standard used vehicle, which is not.